When you empower your employees with an expense account, you trust that they won’t blow a few thousand bucks on a meal at Le Bec Fin. Still, even a business with the world’s most ethical employees needs to keep expense spending under control. To do that, you need to make sure everyone is on the same page by formulating an expense policy. Why Do You Need An Expense Policy?People want to do the right thing when it comes to filing expenses, but sometimes they don’t know what the right thing is. A clear, unambiguous expense policy helps prevent frustration, mistakes, and even the risk of expense fiddling or fraud. You can find good examples online. Concur’s expense policy template (free to download) describes the structure of a best-practice expenses policy and explains what each section should cover and includes sample language. Ditch the jargon. Remind people to use common sense. Double-check that your policy is easy to read and not bogged down in corporate-speak. The easier a policy is to understand, the easier it is for your employees to adhere to it. Make it fair. No one should have to pay out of pocket if they spend sensibly. Invite participation. Ask team members to participate in the process. If they help develop the expense policy, they’ll see why it’s necessary—and they’ll be more likely to adhere to the rules and encourage others to do the same. Use sensible, localised rules. Sometimes a one-size-fits-all policy won’t work across an entire company and you need to adapt to local requirements, such as higher hotel costs in more expensive cities. One good solution is a table of acceptable regional rates. Want more tips and advice on creating an expense policy? 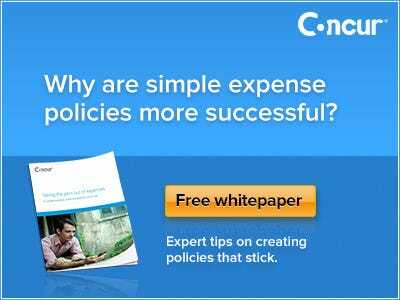 Download Concur’s free “Taking the Pain Out Of Expenses” policy template and white paper for more.